The "Pelorus", on which Thomas Playfair arrived in Australia, was the second ship of the British Royal Navy bearing that name. The original H.M.S. 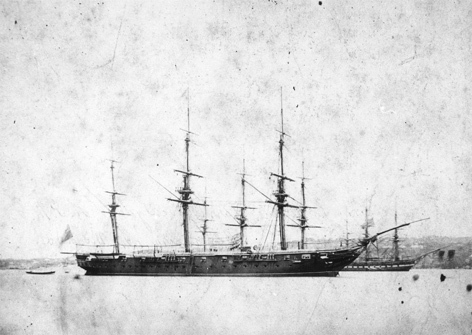 Pelorus was wrecked in Port Essington in Northern Australia during 1839. There are several drawings of the event in the Small Pictures Ships section at the Mitchell Library. The second Pelorus came to Melbourne, Australia in 1859, carrying the twenty seven year old Wardroom Steward, (John) Thomas Playfair. The ship was under the command of Sir Michael (later Lord) Seymour. In 1861 HMS Pelorus became the Flagship of the Australian Station and was the second HMS ship in a total of fifteen to hold this position, the last being HMS Cambrian in 1913.